In the article the sorption ability of microalgae cultures to chromium are discussed. The objects of the study were microalgae from the collection of the Department of Biotechnology of Al-Farabi Kazakh National University, related to cyanoprokaryotes (Cyanoprocaryota/ Cyanobacteria): Anabaena flosaquae, Anabaena arnoldii, Nostoc linckia, Calothrix pariethina as well as their two-species mixtures A. flos-aquae х C. pariethina, N. linckia х C. pariethina, A. flos- aquae х N. Linckia, A. flos-aquae х A. arnoldii and Scenedesmus quadricauda. Also two green (Scenedesmus quadricauda and Chlorhormidium sp.) and one diatomaceous (Nitzshia sp.) algae were studied. The duration of cultivation was 20 days. Potassium bichromate was added to the nutrient medium at concentrations 0.01-0.2 mg/ml calculated per unit of chromium. The concentration of chromium in the filtrates of the studied cultures in some cases significantly decreased by the end of the cultivation period, which indicates the biosorption of this element by the microalgae cells. The investigated strains of microalgae absorb chromium from the medium in varying degrees. The most active biosorbents among the explored cultures were A. flos-aquae, N. linckia and C. рariethina. A microalgae A. arnoldii extracts chromium from the medium in smaller quantities. The listed strains refer to cyanoprokaryotes (cyanobacteria), from other cultures, the Scenedesmus quadricauda absorbs chromium quite actively. The highest intensity of chromium biosorption is characteristic of Nostoc (N. linckia), which extracts from the medium 60.8-74.6% chromium at initial concentrations 0.05-0.1 mg/ ml respectively. The most active biosorbents of chromium were four species of Cyanobacteria. In this regard, these strains have been selected by us for future study of the processes of sorption and metabolic activity in mono- and mixed cultures of microalgae. YERNAZAROVA, G. I. et al. Absorption of chromium by mono- and mixed cultures of microalgae. International Journal of Biology and Chemistry, [S.l. ], v. 11, n. 1, p. 119-126, aug. 2018. ISSN 2409-370X. Available at: <http://ijbch.kaznu.kz/index.php/kaznu/article/view/321>. Date accessed: 24 apr. 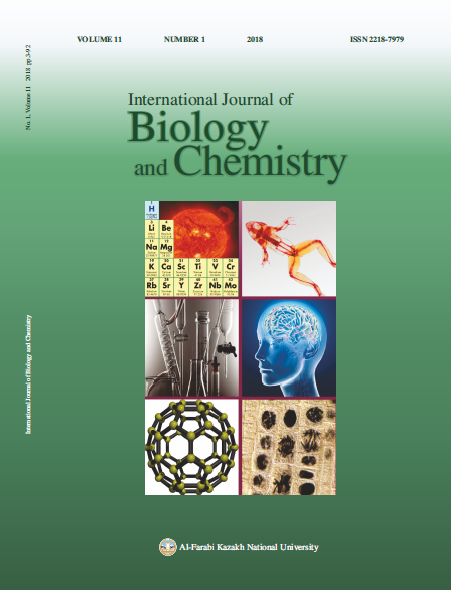 2019. doi: https://doi.org/10.26577/ijbch-2018-1-321.